So, what kinds of investments, whether stocks, bonds, or annuities, go well together, and which kinds clash? You want to include different kinds of investments in any portfolio, preferably investments from different asset classes and, best of all, investments that have little or no correlation. An asset class is a group of investments that share common characteristics. Long-term, investment-grade corporate bonds would be an example. Small cap growth stocks would be another example. United States–based real estate investment trusts (REITs) would be a third. If you already have a portfolio filled with ChickenLickin’ bonds — the last thing you need is another ChickenLickin’ bond. That’s because putting all your eggs in one basket is the surest way to wind up with scrambled eggs (or fried chickens). One distinguishing characteristic of an asset class is that it tends to perform in cycles, and those performance cycles tend to be different than the performance cycles of other asset classes. In other words, two distinct asset classes have limited correlation: They won’t move up and down at the same time. And so, having them together in a portfolio helps make for smoother sailing. 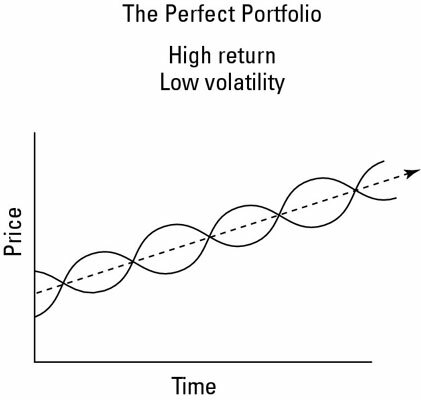 Both investments offer high long-term positive returns and equally high volatility; they move up and down like pogo sticks under a hyperactive child. However, notice that they don’t move up and down at the same time. In fact, these two investments move in opposite directions. They are said to have negative correlation. Because of that negative correlation (easy to find in textbooks, very difficult to find in the real world), Volatile Investment A and Volatile Investment B combine to create a portfolio with socko returns but not a wee bit of volatility. This figure shows what happens when you put them together into the same portfolio: You get the perfect result of high returns and no price swings! Unfortunately, this is only a model. Finding two investments that offer high long-term positive return potential with negative correlation is almost impossible in the real world (although finding one without the other isn’t difficult at all).